2008 is drawing to an end. If you're concerned about the humanitarian effects of cluster munitions or you've just been a Democratic Presidential candidate in the United States it's been a pretty good year, but not so if you run a large car manufacturing company, or a bank, or indeed just have a mortgage. Indeed, the Roaring Naughties are well and truly over - with human security implications down the line I'm sure no-one can fathom yet, although already it looks like around a billion people will go hungry in coming months because of rises in food prices, the majority of them in the developing world. Why are people still going hungry in this day and age? Where have our priorities been? In Geneva we've had a snowy cold snap in the last little while, so while the global financial meltdown continues we can at least snowboard while Rome burns, and watch the newly-bankrupted mega-rich huddle in their fur coats and Jimmy Choo shoes on the rue du Rhone around the Porsche Cayennes they've torched to keep warm. Just kidding. But the festive season is coming, and so it's time for Disarmament Insight to sign off until January. Below we continue our long-standing tradition (well, okay, the one we started last year) of looking back at some of our main blogging themes of 2008. It's hard to believe that this time a year ago the Vienna Conference of the Oslo process on cluster munitions was underway. Twelve months on and the Convention on Cluster Munitions (CCM) is a reality after a tough meeting in Wellington, New Zealand in February, and the negotiations themselves over two weeks in May in Dublin, Ireland, not to mention a huge amount of effort from so many people over the last several years. It's been truly inspiring to participate in the Oslo process, and the week before last 94 states signed the treaty in Oslo, Norway, which just capped it all off. Disarmament as humanitarian action, indeed. Things haven't gone so well in the UN Convention on Certain Conventional Weapons (CCW) talks in Geneva, which underwent something of a crisis in November as the Danish Chair's attempt to push through a protocol based on his draft text were rebuffed by a group of 26 states. 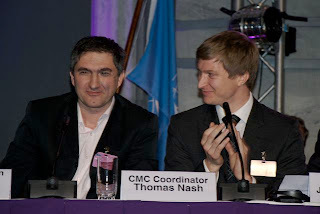 A rather nasty blame game ensued, but the CCW managed to agree to come back for a week or two in the first part of 2009 to have another shot at trying to achieve something acceptable both to those cluster munition user/possessor states who shunned the Oslo process, and the majority of the CCW's membership that support the CCM. With the best will in the world, the CCW will have its work cut out for it in the New Year. There was an extremely important domestic election for world politics in November. Yes, that's right, Helen Clark's Labour Government in New Zealand were voted out in favour of the centre-right National Party. Oh, yes, and there was that other election...of that Obama guy. Currently the arms control world - particularly inside the Washington beltway - is rife with speculation about what Obama's administration will do after taking up the reins of power in January '09 on nuclear weapons. President Obama pushing for successful U.S. ratification of the Comprehensive Test Ban Treaty would be a great start it seems to me: it may not bring the treaty negotiated more than a decade ago into force thanks to the CTBT's international entry-into-force formula, but it would send a very positive signal and further embed the emerging global norm against nuclear testing. And some leadership and clear momentum is needed right now on nuclear issues, especially if the Nuclear Non-Proliferation Treaty (NPT) 2010 review conference is to be a success. Issues over Iran and compliance continue to dominate its preparatory process, of course. But more generally there is the sense around that we may be on the cusp of something hopeful with respect to nuclear disarmament. While the last two decades have seen too many missed opportunities for the world to move closer to nuclear abolition, the next couple of years hold considerable promise if some of the new ideas and new coalitions that have emerged over the last year or two are taken up by states and Iran's alleged NPT non-compliance is substantively addressed. Meanwhile, paralysis in the Conference on Disarmament continues. 2008 was also a significant year for work on curbing the effects of small arms and gun violence. In July, Patrick Mc Carthy wrote that the UN small arms process is "back on track" in its implementation of the 2001 Programme of Action following difficulties in 2006 that prevented assessment of the PoA's overall impact and strengthening of implementation. Despite opposition from Iran and Zimbabwe, the 2008 Biennial Meeting of States in New York adopted a substantive and forward-looking final document. We've had a bunch of other interesting posts on this blog covering all sorts of issues, from piracy to the Mine Ban Treaty to expertise in mediation and negotiation with respect to Zimbabwe, biological weapons and even why the Arcade Fire and Duran Duran are like the Oslo process and CCW. We've also had the odd book review, which have prompted some spin-off blogs. Meanwhile, we've been very fortunate on the Disarmament as Humanitarian Action project at UNIDIR to have had two sterling Visiting Fellows this year, who've provided welcome intellectual argument, lots of coffee and prolific blogs. Maya Brehm came from Copenhagen University for three months and never left, which worked out very nicely for us. Our other visiting fellow, Rocky Horror Picture Show fan Virgil Wiebe, helped us to keep track of the CCW, but finally had to return with his family to tropical Minneapolis at the end of November. Ferney-Voltaire will never be the same again... We've seen some other departures too, with Patricia Lewis leaving UNIDIR and taking up a new role as Deputy Director and Scientist-in-Residence at the Monterey Institute. And Patrick Mc Carthy moved to a new role with UNDP from October concerning the Coordinating Action on Small Arms (CASA). His successor as Geneva Forum Network Coordinator, Silvia Cattaneo, has now come on board, so welcome Silvia, and good luck Patrick! As 2008 ends, so too the Disarmament as Humanitarian Action project draws to a close after five years of research and outreach, four volumes of published work (our final volume will be out very shortly) and numerous articles, meetings and, of course, blog posts. A big thank you is due to our principal donor, the Government of Norway, as well as to the Netherlands along with all of those people who've helped us with input and support along the way (not least our guest bloggers). However, this is not really the end of DHA. The Disarmament Insight blog will continue in the New Year, and we might run further meetings along the lines of the five symposia we've held with our partner the Geneva Forum, which have been very successful and culminated in our November residential seminar in Glion. And, Maya and I have been carrying out research since March of this year on a spin-off DHA project to research an analytical history of international efforts to address the humanitarian impacts of cluster munitions, to be published in late 2009. The CCM and the Mine Ban Treaty's implementation have shown that humanitarian disarmament is alive and well. So, it's busy, busy, busy. I hope everyone who reads our blog has a wonderful festive season. Keep reading Disarmament Insight and commenting on it: we'll be back in the New Year. Picture by John Borrie. We're tired out pussycats too. As of writing, 94 countries have signed the Convention (a list of 92 is here - add Cote d'Ivoire and Guinea Bissau), and more seem certain to follow in weeks and months to come. There are some surprises among them such as Afghanistan as mentioned in a preceding post. Some big possessors and users of cluster munitions stayed away last week, of course, such as China, India, Israel, Pakistan, Russia and the United States. Much has been made of this in the media, but it's by now really a non-event as these countries shunned the Oslo Process and so it was no surprise they would be no-show-ers. Instead the U.S State Department's spokesperson asserted from far away in Washington D.C. that "the CCM constitutes a ban on most types of cluster munitions; such a general ban on cluster munitions will put the lives of our military men and women, and those of our coalition partners, at risk." The fact that the majority of those coalition partners were represented in Oslo in order to sign the new humanitarian disarmament norm was omitted, since presumably it is at odds with this opinion. Brazil, however, attended as an observer, and there are some signs that it may be reconsidering its opposition to joining the CCM - not least because of the support for the treaty from so many of its Latin American neighbours. Brazil's views on joining the treaty matter to countries like its traditional regional rival Argentina (which participated actively in Dublin, but hasn't yet signed the CCM), and vice versa. Let's hope that leaders in the two countries can turn the situation into what scholars call a 'trust game'. Both would be better off in security terms joining the Convention and disposing of their stocks of cluster munitions, rather than keeping them for use against each other. There was something of a party atmosphere throughout the Signing Ceremony week, especially as so many of those here who had been through the Oslo Process wringer together could now patch up any animosities, clap each other on the backs and have a galactic p*ss-up together. Perhaps some of this bonhomie permeated the party of NATO Foreign Ministers, who arrived en masse on Wednesday afternoon by charter plane from Brussels to make their statements welcoming the Convention and each sign the treaty before flying on to the Helsinki OSCE Summit. David Miliband - the object of British NGO Landmine Action's innovative campaign in Westminster Tube Station to get cluster munitions "Milibanned" - spoke in glowing terms about the new treaty. And French Foreign Minister Bernard Kouchner's statement was (perhaps to no-one's surprise) the most colourful as he proclaimed (in French) "Yes, we can! We can, and the US can sign this treaty, Russia can, and China can" adding that he'll press American President-elect Barack Obama to sign. Good luck with that. Of course, all of these signatures to the CCM obscure a more concrete and significant fact: that already four countries of the 30 required to bring the treaty into force internationally have ratified (Ireland, Norway, Sierra Leone and the Holy See). At this rate the CCM may enter into force globally rather soon - it is possible the first Meeting of States Parties will be as early as mid-2010. Laos, usually something of an international recluse and the most seriously affected country from cluster munitions, has come forward to offer to host the First Meeting of States Parties. And more attention is now turning to how the new CCM will be implemented, which entails settling some big questions about how a regime of doing and not just being a new humanitarian norm will be developed. There is a lot synergy, of course, with the Anti-Personnel Mine Ban Convention and how its implementation regime has developed over the last decade, and many useful lessons were learned that fed in to improving the text of the CCM treaty itself in the Dublin negotiations in May. But there are also some differences. The number of cluster munition affected countries is much smaller than were seriously blighted by anti-personnel mines in 1997, and the overall number of survivors is smaller too. Moreover, some survivors are being assisted already because of the Mine Ban Convention. And of course the Mine Ban Convention has some serious issues of its own such as states missing deadlines for clearance and stockpile destruction, which Maya Brehm and Megan Kinsella discussed in an earlier post. One big issue for implementation will be to develop a more accurate picture of the dimensions of the cluster munition problem. Neither the mine ban nor cluster ban treaties make specific provision for this beyond their (differing) national reporting requirements for state parties. This led to the emergence of the civil society Landmine Monitor initiative in the context of the Mine Ban Convention, and a key question for NGOs now is how that expertise and experience can be further leveraged for a sort of 'cluster munition' Monitor. This weekend they are mulling over just that in Oslo. And this touches on one of the biggest challenges of all: to ensure that while momentum is maintained and even increased for entry into force, universalisation and implementation of the CCM, implementation of the Mine Ban Convention doesn't suffer as a result. Indications are that many governments central to the Oslo Process, the UN, ICRC and NGOs like the International Campaign to Ban Landmines and Cluster Munition Coalition are well aware of this. 2008 has been a huge year for international efforts to address the humanitarian impacts of cluster munitions as regular readers of this blog may have gathered from our ongoing commentary on the both Oslo and CCW processes. Indeed, we've followed the Oslo Process from the very beginning on Disarmament Insight. Documents and media related to the Oslo CCM Signing Conference are accessible here. 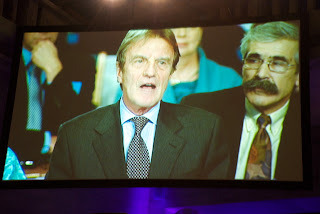 Picture of Bernard Kouchner giving his statement on 3 December by John Borrie. 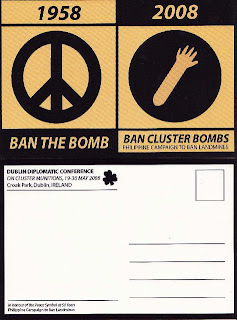 The Philippine Campaign to Ban Landmines (PCBL) designed the postcard above for the Dublin Diplomatic Conference on Cluster Munitions in May this year. The postcard was distributed to participants there with a message to support a cluster munitions ban treaty this year, and also commemorates the 50th anniversary of the Campaign for Nuclear Disarmament (CND) and its Ban-the-Bomb symbol – a symbol that later became the more broadly meaningful Peace Symbol. It’s timely to bring this up again on the occasion of the Oslo Signing Conference for the new Convention on Cluster Munitions (CCM), which comprehensively bans them as a class of weapons, and which commenced on Wednesday. When we made the postcard before the Dublin Conference, achieving such a comprehensive ban treaty wasn’t yet certain. After the successful treaty negotiations at Dublin, the treaty is now about to become a reality in international law. Through the main motifs in black and yellow orange on the front of our postcard, we wanted to show the continuing a link, from left to right, between the oldest (A-bomb) and the newest (cluster) bomb ban advocacies between 1958 and 2008. It reflects a historical continuum of 50 years of bomb banning and peace advocacy, as well as an element of solidarity with and outreach to other generations and causes in peace activism, especially those who have advocated nuclear disarmament. The postcard was meant to recall and honour those who were generations ahead of the current Cluster Munition Coalition (CMC) and paved the way for humanitarian disarmament campaigning. In Holtom’s original design, the lines were not so cleanly straight as they have been in more recent years (as adopted in our postcard), but instead were curved outward on both sides of the lines where the hands palm outstretched, the head and feet of the despairing figure were supposed to be. Almost as an afterthought, Holtom also saw that the symbol represented a composite of the semaphore signals for the letter N (someone holding a flag in each hand stretched outwards and downwards) and D (a single flag held vertically above the head) – thus Nuclear Disarmament. So, in those earlier years in Britain, it was known more as the “disarmament symbol,” “ND symbol,” or “CND symbol.” Holtom himself was said to have regretted the connotation of despair and wanted the sign inverted to instead connote something more like hope, resurrection or elation. Also, the inverted image of a figure with arms stretched upwards and outwards represented the semaphore signal for U – Unilateral, as in unilateral action as the key to nuclear disarmament. But the original symbol is what stuck and caught on. Bayard Rustin, an American activist in the 1958 march, took the symbol back to the U.S., where it eventually became the Peace Symbol globally. From a symbol of despair, it came to acquire near universal significance as a symbol of peace and protest, especially of the anti-war sort. At the back of our postcard pictured above, we indicated in upper left the occasion and venue: “DUBLIN DIPLOMATIC CONFERENCE ON CLUSTER MUNITIONS, 19-30 May 2008, Croak Park, Dublin, IRELAND” with the Irish shamrock symbol to its immediate right. (We misspelled the name of historic Croke Park.) Because the venue was Ireland, we wanted to use the Irish colour green for this text, but decided to stick with black to economize on production costs. And so that text and the Irish shamrock at the back of our postcard came out in black. When we showed the postcard to Irish peace activist friend Clem McCartney and his Chilean anti-war activist partner Roberta Bacic on meeting up with them in Dublin outside the conference, surprisingly they commended us for its “black shamrock,” – which we learned from them is an Irish symbol of mourning and resistance. Huh, PCBL had inadvertently used an Irish protest symbol? And so – perhaps like Holtom – our postcard was loaded with anti-war symbols to a greater extent than we had originally intended. In fact, toward the end of the Dublin conference we actually came across that “Black Shamrock” symbol again on the T-shirt of an Irish anti-war activist who participated in a side event to the conference, a Public Talk on “Achieving a Cluster Munitions Ban: Blueprint for an Ethical Foreign Policy?” with former Irish Assistant Secretary General Denis Halliday, sponsored by Action from Ireland (Afri). At the end of the conference I chanced upon Finnish campaigner Jan Koskimies of the Peace Union of Finland/Committee of 100. He was wearing on his lapel a Peace Symbol pin of Holtom’s original design. Seizing the moment, I asked Jan if I could buy (yes, buy) his pin. He said, no, he would give it to me since there were many more of them back where it came from in his organization. It turns out that the Committee of 100 was the more widely known successor to the Direct Action Committee Against Nuclear War (DAC), which had planned the 1958 Easter weekend protest march to Aldermaston. To somehow return the favour, I could only give Jan our postcard – maybe not the fairest exchange. Exchange? Yes, let’s learn the lessons from each other’s campaigning histories and so connect the dots between arms control, disarmament, humanitarian law, human rights, and peace. Let’s invoke the spirit of the best in humanitarian disarmament and peace campaigning. And we may yet develop a new, more interlinked and holistic, humanitarian disarmament network. This is a guest blog by Sol Santos. Sol is Coordinator of the Philippine Campaign to Ban Landmines. Image courtesy of Kara M. Santos. At close-of-play of the first day of the two Signing Ceremony of the Convention on Cluster Munitions (CCM) at 6 o'clock this evening, Norwegian Foreign Minister Jonas Gahr-Store announced that, so far, 92 countries have signed the treaty. More will follow tomorrow. Whether the treaty will hit the symbolic 100 mark then is uncertain. But irrespective of whether it does, the fact that more than 90 countries - including the most heavily cluster munition-affected states including Afghanistan, Laos and Lebanon - sends a very strong signal of international support for this new humanitarian disarmament norm. Afghanistan's representative has just taken the floor at the Signing Ceremony of the Convention on Cluster Munitions (CCM) to announce that his delegation has received new instructions from President Hamid Karzai. Afghanistan, some readers of this blog will recall, did not participate in the Dublin negotiations. Afghanistan said just now that this "principled position" concerning non-participation in the Oslo Process because of its national situation had now changed, and the country will immediately move to sign the CCM - I assume here in Oslo City Hall today. Afghanistan's support for the CCM is very significant, being as it is a country affected by cluster munition contamination and in which a war is being fought. NATO forces have - apparently as a matter of policy - not used cluster munitions since 2003, on the basis that they are inappropriate weapons for the conditions. Afghanistan joining the Convention will cement this. Pirates. Not the images that fill legends, sea tales or the covers of cereal boxes but young men, some still boys, armed with automatic rifles and rocket-propelled grenade launchers, honing heavy necklaces of ammunition and overtaking vessels, crews and cargo to ransom. The piracy in the Gulf of Aden is a grim reminder of what the illicit market of small arms and light weapons (SALW) can perpetuate. The sheer size of the vessels and the value of the cargo—be it oil or (eyebrow-raising) arms deliveries—shows how a relatively small amount of guns has the physical and figurative power to take over a giant. In 2008, at least 95 attempted acts of piracy have been reported in the Gulf of Aden, dozens in the last weeks alone. Successful ransom payouts for over a third of these incidents (amounting to about US$ 30 million) promote the idea that piracy pays well. But who wants to tell the families of the crews held hostage that the lives of their loved ones don’t merit a payout? And who wants to imagine the effects of 2 million barrels of crude oil released into the ocean by dissatisfied pirates or as a consequence of an explosion with the weaponry brought on board? The insecurity also has broader implications for the 20,000 vessels that annually travel through the Suez Canal and the Gulf of Aden: Heightened prices for one thing as shipping companies adjust their travel routes and pay significantly higher insurance premiums. More militarized seas is another. NATO and other military vessels monitor the area and provide escorts to shipping vessels, but the amount of ocean that needs to be covered is simply too large and chasing pirates is a costly use of time and resources. But what about the factors that motivate piracy in the first place? There are some fundamental points that we understand (and forever preach) at a policy level, but look away from in practice. We all know that Somalia is branded a “failed state”, which, save for a bit of backstage anti-terrorism, the international community seems pretty much to have given up on. Most of the recent cases of piracy involve young men from the self-declared state of Puntland, one of the poorest areas in Somalia, where there is no industry, almost no public institutions and minimal future prospects. Waters off Somalia are heavily (and illegally) fished by commercial vessels from around the world, though its own fishing industry has collapsed. What Somalia does have is a rampant illicit market in small arms and an idle population that has become accustomed to violence. Working on the issue of SALW over the past years, I am pleased that states overwhelmingly voted (or agreed in consensus) in favor of 6 resolutions on SALW at the 63rd session of the UN General Assembly. All of the resolutions provide at least incremental steps forward, such as establishing an Open-Ended Working Group for the Arms Trade Treaty in 2009 and a Group of Governmental Experts for surplus ammunition; calling upon states to establish national controls on illicit brokering; and aiming to better understand the interrelationship between armed violence and development. Another one, known as the ‘Omnibus resolution’,ensures that the UN process to address the illicit trade in small arms will proceed with some defined dates and solid direction for the coming five years. Unlike so many of the other disarmament issues, SALW is not as trumped at the policy level. Governments are generally comfortable dealing with the illicit trade of SALW. But the gap emerges in the implementation of policies. Considering that the UN Programme of Action on the Illicit Trade in Small Arms and Light Weapons (PoA) is in its 8th year of implementation, and considering we’ve recognized the inexorable link between security and development, we should be seeing by now more tangible improvements in the general capacity of states to address the illicit trade in SALW and the demand that beckons it. So why aren’t we? Is it that we are just not good at walking the walk once we’ve done the talk? But it is true, even if the PoA and all other SALW instruments and resolutions past and present were fully implemented, Somalia would still be in a mess and armed groups would still have the immediate capacity to be pirates—Somalia needs more than any resolution the UN could muster. Shipping companies will soon find better ways and means to fend off pirates, thus decreasing the opportunities for successful piracy. Strong arms control measures at the national and international level (and the capacity/commitment to actually practice those policies) would mean pirates would have less access to the types and quantities of arms and ammunition they currently have. But addressing arms and opportunity is not enough. We have to deal with the motivation for arms and piracy in the first place (in SALW language “demand”). The case of piracy in the Gulf of Aden reminds us that economic and humanitarian hardships (or soft issues as they are sometimes called) are not as extractable from the hard strategic interests of states at large. For those who continue to refute the relationship between arms, poverty and violence, all I can say is arms+motivation+opportunity=problem. Argh! Shiver me timbers, it ain’t rocket science. 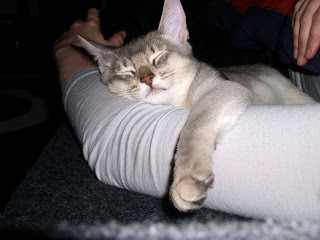 This is a guest blog by Kerry Maze. Kerry manages the UNIDIR project on 'Multilateral Assistance for Implementing the UN Programme of Action on Small Arms'. 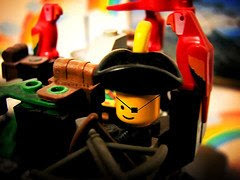 Photo Credit: 'Happy Talk Like a Pirate Day! ARRRGH!!' by CORDAN on Flickr.